Transnational Giving Europe (TGE) is a partnership of leading European foundations and associations that facilitates tax-efficient cross-border giving within Europe. 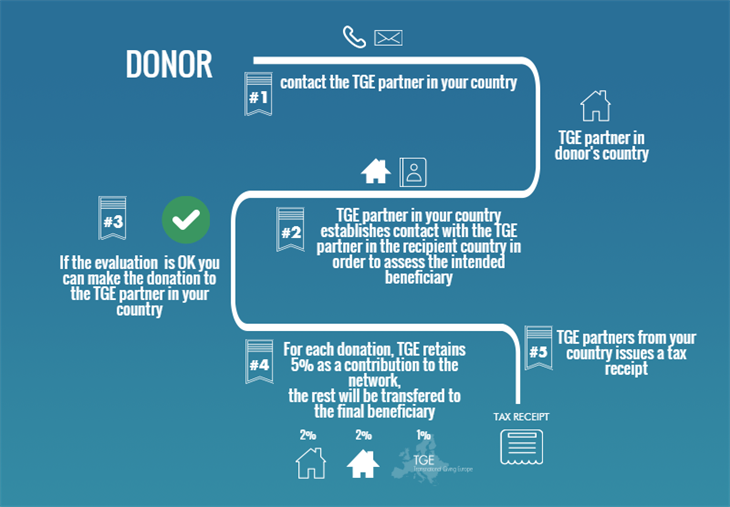 The TGE network enables donors, both corporations and individuals, resident in one of the participating countries, to financially support non-profit organisations in other member countries, while benefiting directly from the tax advantages provided for in the legislation of their country of residence. – Does your organisation have fundraising opportunities abroad? – Does the cause you serve knows no boundaries? – Are your potential donors abroad interested in tax effective giving? – Do you wish to extend fundraising beyond your national borders, but miss the local branch network to handle the gifts? -Europe-wide Opportunities to Mobilise Resources:By providing a secured and tax-effective cross-border giving framework, TGE builds a bridge between your organisation and prospective donors abroad. Receiving tax-free contributions from foreign donors, appealing to expatriates, approaching global partners such as multinational corporations, benefiting from borderless interest in your cause or capitalising on global exposure offered by Internet is within arm’s reach. The TGE network does not raise money on behalf of your organisation, but enables you to make the most of fundraising opportunities available to your organisation in as many as possible European countries. Note that TGE is not meant to be used for massive fundraising campaigns using promotional data acquired through the purchase, rental or exchange of data or using important media campaigns. Beneficiaries using TGE should at all times respect ethical principles agreed by the network in their communication towards donors. -National Fiscal Incentives to Charitable Giving: Once approved as an eligible recipient of transnational gifts by TGE, your organisation will benefit from fiscal incentives to charitable giving provided for by national regulations in the same way as domestic charities. Supporting your organisation will yield the same tax benefits for foreign donors as supporting non-profit organisations in their home country. -Expertise in National Tax Laws: TGE enables your organisation to extend fundraising to foreign countries, without having to set up branches or sister organisations for that sole purpose and without having to master different national laws. TGE offers you the comfort of relying on a support infrastructure managed by leading national foundations, with experience in tax laws and the non-profit sector in their respective home countries. Tax questions from prospective donors, gift procedures and donations to your organisation will be handled by TGE partners, ensuring a global approach and the most effective tax treatment for donors, whether individuals or corporations. -Administrative tasks taken care of for you: TGE carries out all administrative tasks related to the tax deductibility of gifts. Depending on the country’s tax laws, TGE partners will fill in all relevant tax forms and deliver, whenever applicable, fiscal receipts testifying to the contribution made. -Operational Costs: A 5% fee is taken on the donated amount for gifts up to 100.000€. For higher gifts, 1% of the amount in excess of the 100.000€ is charged. The maximum operational cost is 15.000€. These operational costs help the TGE network to find new partners with the aim of offering tax effective giving in all the Member States of the EU and to provide free practical information concerning cross-border philanthropy in Europe. – Are you aware of a cause or organisation outside your home country, which you would be keen to support? – Are you interested in tax effective cross-border giving? – As an expatriate, would you like to continue to help the charity you used to in your country of origin in a tax-efficient way? – Are you concerned about making gifts to quality projects and organisations? – As a multinational, would you like to hear about flexible and tax effective global corporate giving? -Reliable Framework: TGE offers the comfort of a network of prominent grant-making foundations, anchored in each of the countries covered, where they have outstanding relationships with most non-profit organisations and enjoy the confidence of national authorities. They ensure your contribution is allocated to the foreign charitable organisation you have chosen to support. -Quality Review of Beneficiaries: TGE partners’ long-standing experience as grant-makers and intimate knowledge of the non-profit sector in their home country serve your generosity. Their involvement with your gift is your guarantee of the quality of the project and organisation you wish to support. -Tax Effective Cross-Border Giving: Your cross-border donation receives all applicable tax benefits in the country where you pay tax. The Partner foundations’ combined expertise in domestic tax laws secures the most effective tax treatment for your gift in both your own country and the recipient’s. -Flexible and Effective Global Giving Management: TGE enables multinational corporations to freely organise their philanthropic giving to best suit their business strategy and community involvement policy, without having to master different tax laws and national regulations. Created opportunities include centralising all philanthropic giving out of most favourable tax jurisdiction and in accordance with corporate profits, or setting up joint corporate campaigns involving individual contributions by local branches and employees. -Simple and Standard Procedure: A single counterpart – your national foundation, a national phone call or mail in your mother tongue and a regular domestic payment to make gifts to beneficiaries in any of the eligible countries. TGE keeps you informed throughout the procedure and carries out required formalities for tax relief. A 5% contribution is taken on the donated amount for gifts up to 100.000€. For higher gifts, 1% of the amount in excess of the 100.000€ is charged. The maximum operational cost is 15.000€. Banking fees are invoiced when actually incurred. A 5% contribution is taken on the donated amount for gifts up to 100.000€. For higher gifts: 1% of the amount in excess of the 100.000€ is donated to TGE. The maximum contribution is 15.000€. This contribution helps the TGE mission “enabling philanthropy across Europe” through activities such as finding new partners in all the Member States of the EU, provinding free practical information concerning cross-border philanthropy in Europe or attending small amount donations.